These Stands for iPad have a Poster Holder for your Graphics! This stand is used in a number of different venues, including retail stores, exhibition centres, offices, restaurants, bars, malls, information centres, and trade shows. By utilising a classic method combined with the interactive qualities of the iPad, your business will stand out from the competition and provide customers with a fun and informative experience! Cable management is provided within the stand to keep wires out of sight! A power strip within allows you to power the display and accessories easily, with enough room for storage of posters and other small items! Please Note: This product has been designed to fit Apple iPad® Air, Air 2, 6th Gen, & 9.7" iPad Pro. 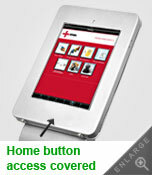 Although other makes & models of tablets may fit into this unit, there is no guarantee of an accurate fit. Stands for iPad display a 920 x 320mm poster on the front of stand! Locking mount help prevent theft without affecting performance! iPad Holder Great for Exhibitions! The stands for iPad include a poster mount for the front of the display. The poster is 920 x 320mm, and attaches using satin silver standoffs! The iPad holder makes switching out graphics very easy, and combining a classic marketing method with the latest in technology provides a familiar and fun way for customers to interact with the display! The digital kiosks, stands for iPad are able to hold generations Air, Air2, 6th Gen, & 9.7" iPad Pro of the Apple iPad®. 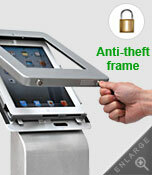 The iPad holder is a lockable display to be used in public areas without worry of theft. 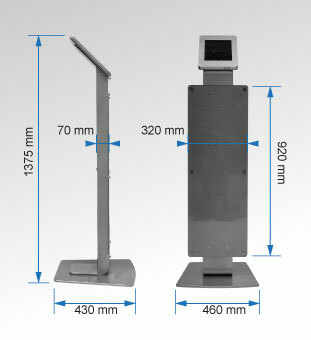 This allows employees to freely interact with customers without having to keep a constant eye on the iPad kiosk stand! Digital kiosks, iPad holders, and other stands for iPad fully cover the home button, preventing tampering with the device. Air vents around the unit help ensure the display doesn't overheat. The iPad holder is made from steel for a durable unit that can be used in heavily trafficked areas without breaking down! The iPad holder feature a satin silver finish that provides a professional look in any environment. 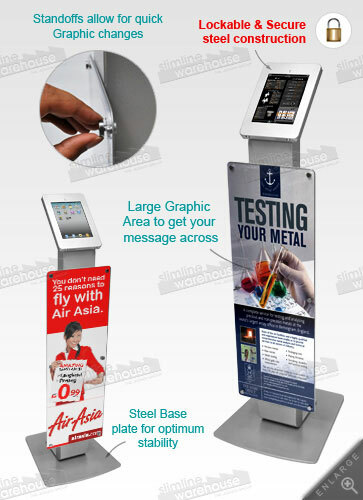 The iPad kiosk stand has a number of applications within your business, including showing a company website, product videos, or a fully interactive app for customers to learn more about your business and services. Many different types of digital kiosks are available to choose from, including varieties of counter-top, floor-standing, & wall-mounted stand displays. The multiple options ensure your business can choose an effective display for use within your company! 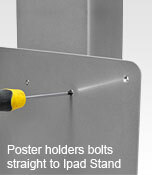 The iPad stands have a poster holder on the front that displays a 920 x 320mm graphic. The graphics are a great way to mix a traditional method with new technology. 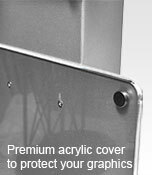 The casing helps to prevent tampering & theft to your tablet display at trade shows & other events. The display with poster holder has a secure mount for holding generations Air, Air 2, 6, & 9.7" iPad Pro of iPads. So many products are found in the online catalogue that can help out businesses that we have become a national leader! From standoffs and lightboxes to panel displays and business card holders, Slimline Warehouse is your best choice online for a large range of displays. Our lines of products are made of the highest quality materials and offered with low prices, a proven combination! Orders paid prior to 1pm EST will despatch to anywhere in Australia same day when in stock!